Context: Lead is the conventional shielding material against gamma/X-rays. It has some limitations such as toxic, high density, nonflexibility, and also bremsstrahlung production during electron interaction. It may affect the accuracy of radiotherapy outcome. Aims: To theoretically analyze the radiation shielding properties of flexible polyvinyl alcohol/iron oxide polymer composite with five different concentrations of magnetite over the energy range of 15 KeV–20 MeV. Subjects and Methods: Radiological properties were calculated based on the published literature. Attenuation coefficients of pure elements are generated with the help of WinXCOM database. Results: Effective atomic numbers and electron density are increased with the concentration of magnetite. On the other hand, the number of electrons per gram decreased. Mass attenuation coefficient (μ/ϼ) and linear attenuation coefficients (μ) are higher in the lower energy <100 KeV, and their values decreased when the energy increased. Computed tomography numbers (CT) show the significant variation between the concentrations in <60 KeV. Half-value layer and tenth-value layers are directly proportional to the energy and indirectly proportional to the concentration of magnetite. Transmission curve, relaxation length (ƛ), kinetic energy released in the matter, and elemental weight fraction are also calculated and the results are discussed. Conclusions: 0.5% of the magnetite gives superior shielding properties compared with other concentrations. It may be due to the presence of 0.3617% of Fe. Elemental weight fraction, atomic number, photon energy, and mass densities are the important parameters to understand the shielding behavior of any material. Metallic polymer nanocomposite has enhanced physical properties compared with its counterparts in macroscale such as thermal, mechanical, optical, and electrical properties., Polyethylene and borated polyethylene are used as neutron shielding materials. However, when exposed to continuous radiation, their mechanical properties, thermal stability and durability turn poor. In recent years, few research groups have studied the shielding properties of polymer nanocomposite materials. Among them, Shruti Nambiar et al. studied the radiation shielding effectiveness of polydimethylsiloxane/bismuth oxide nanocomposite. Their result suggests that 44.44 wt% of bismuth oxide and 3.73 mm thick polydimethylsiloxane/bismuth oxide nanocomposite attenuated all the scattered radiations from 60 kV X-rays. Badawy et al. developed a nanocomposite based on the magnetite with polyvinyl alcohol (PVA). They concluded that the PVA/magnetite nanocomposite film showed enhanced radiation shielding properties. It may be due to the fact that saturation magnetization Ms is lesser than pure magnetite due to the presence of PVA and superconducting behavior at room temperature. Radiation shielding properties of many materials have been verified by several authors with the help of theoretical calculation or experiments or both, for polymers and plastics,, superconductors, alcohols, phantom and human organs and tissue substitutes, silicate and borate heavy metal oxide glasses, poly boron, building materials, various ores, and some alloy materials. The present analysis theoretically verifies the radiation shielding effectiveness of PVA/magnetite-polymer composite with the help of relevant radiation shielding properties over the energy range of 15 keV–20 MeV and results are compared with the previously published data. Mass attenuation coefficients (μ/ϼ) of pure elements are generated with the help of WinXCOM database. According to the published literature, radiological properties such as mass attenuation coefficient (μ/ϼ) and gamma ray transmission factor (TF), computed tomography number, density, effective atomic number, electron density, and the number of electron per gram are calculated. Mass absorption coefficients (μen/ϼ) are connected with kinetic energy released per unit mass (KERMA) described by Manohara et al. and Mann et al. where, (μen/ϼ)com and (μen/ϼ)air are the mass energy absorption coefficients of composite and air, respectively, and Ka is the KERMA relative to air. μ (cm -1) and x are the linear attenuation coefficient and absorber thickness, respectively. exp-is the exponential (2.718). Uncertainties are possibly related to the mass absorption coefficient (μen/ϼ) and mass attenuation coefficients (μ/ρ). which is <1% for elements (1 < Z < 8) at 0.03–0.1 MeV. 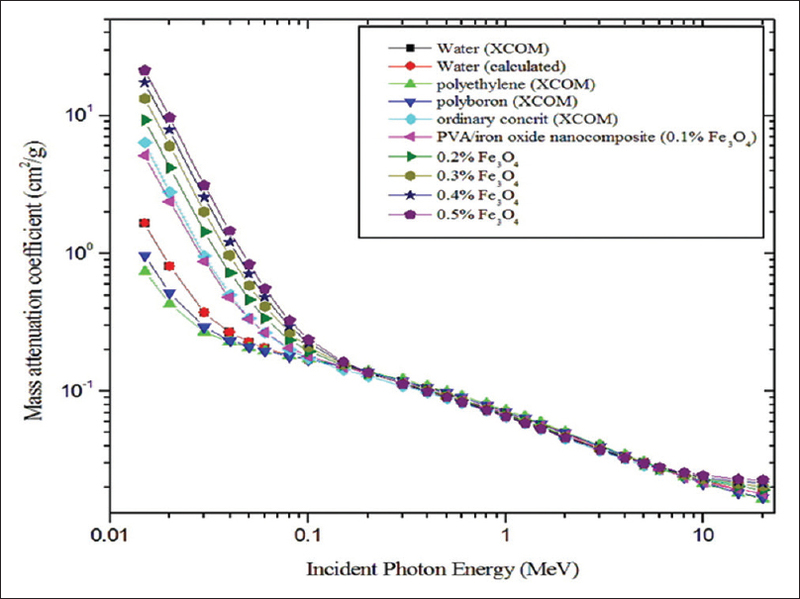 And, for photon energy 0.03 > E > 0.1 MeV error was 5%–10%. For medium Z elements (11 < Z < 29) 1%–2% for 0.01–0.1 MeV and 2%–3% for 1–100 MeV. These errors are not going to make much difference in our results. Our aim was to develop the nontoxic, less weight, and flexible biological shielding materials against gamma/X-rays. At higher concentration of magnetite, polymer composite may be losing their flexibility and the weight is increased. Hence, we studied only up to 0.5% of metal oxide (Fe3O4) in the PVA. For checking the reliability of our calculation, we selected the well-known compound water and calculated its radiological properties which were in good agreement with previously published data (not shown in the manuscript). [Table 1] shows calculated values of elemental weight fraction, effective atomic number (Zeff), the number of electrons per gram (ne), and electron density (ϼe) for PVA/iron oxide composite with five different concentrations of magnetite. Zeff and ϼe increased with increasing concentration of magnetite, and the numbers of electrons per gram decreased. The addition of magnetite increases the percentage of Fe (iron) in the polymer composite. For the validation of attenuation coefficient, we performed the calculation for water and compared with WinXCOM database [Figure 1]. We did not observe any significant difference. Mass attenuation coefficient (μ/ϼ) and linear attenuation coefficient (μ) for PVA/iron oxide polymer composite are shown in [Figure 1] and [Figure 2] respectively. Both coefficients ([μ/ϼ] and [μ]) are dependent on the incident photon energy and chemical composition, and these decrease with increasing the photon energy. At lower energy range, (μ/ϼ) and (μ) coefficients values are higher. 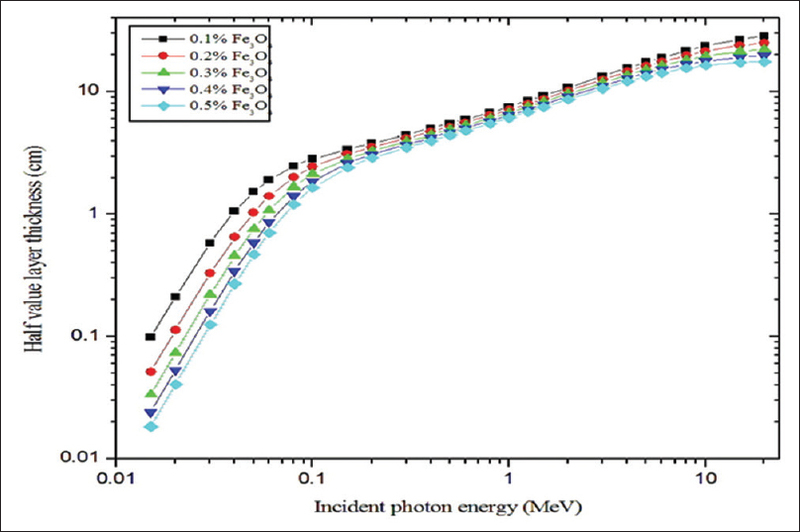 For incident photon energies up to 100 keV, the difference in attenuation between materials is quite evident, but it slowly decreased with increasing photon energy. Computed tomography numbers (CT) were calculated over the energy range of 0.15–20 MeV [Figure 3]. Magnetite with 0.5% concentration and 15 keV gives the highest value of CT number at 11841 Hounsfield unit ( HU). And also, for energies up to 60 keV CT numbers varied much with concentration. This variation was not observed in the higher energy range. Hence, chemical composition dependence was higher in lower energy. 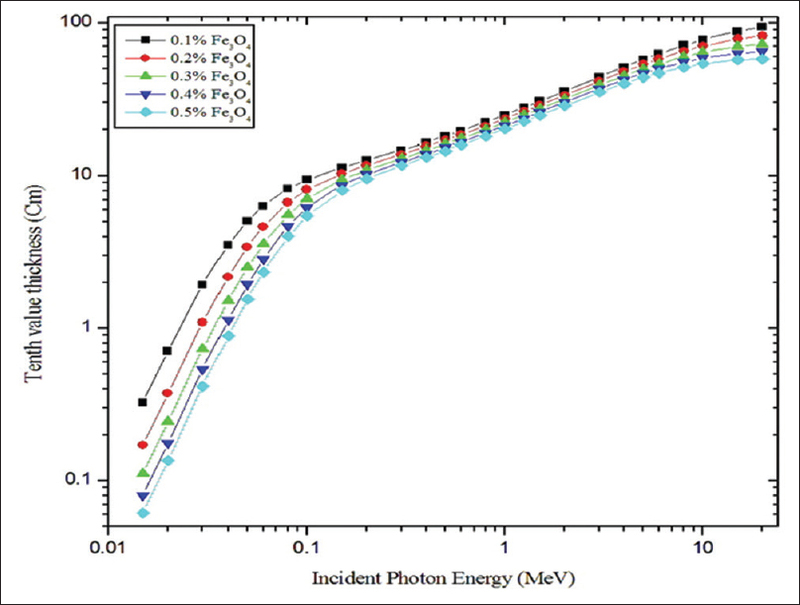 [Figure 4] and [Figure 5] show half and TVLs of the polymer composite with an incident photon energy range of 0.015–20 MeV, respectively. In the <100 keV energy range, both HVL and TVL show sufficient deviation with respect to the concentration of magnetite and in the intermediate energy range (100 keV < E < 5 MeV) no such considerable variation was observed and for incident photon energies >5 MeV to 20 MeV little deviation was observed. 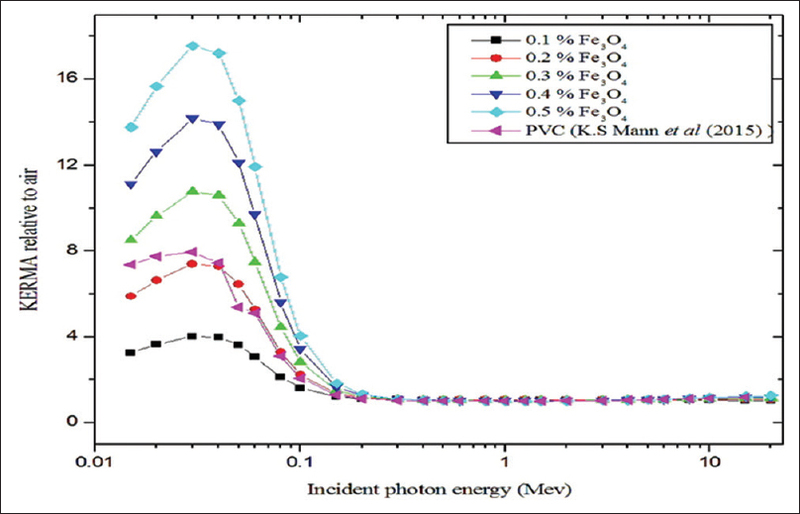 In the entire photon energy range (0.015–20 MeV) 0.5% of magnetite exhibited superior behaviors compared with other concentrations, i.e., less thickness was enough to attenuate the radiation intensity to the desired level. Gamma ray TF for the material (0.5% of Fe3O4) was calculated for 10 cm to 100 cm thicknesses of the polymer composite as a function of incident photon energy (0.15 MeV to 20 MeV). This is shown in [Figure 6]a and [Figure 6]b. Transmittance was dependent on the incident photon energy and thickness of the material. It was higher at lower thickness of the material and higher energy of the photons. TF values are higher for polymer composite with 10–50 cm compared to the 60–100 cm thickness. 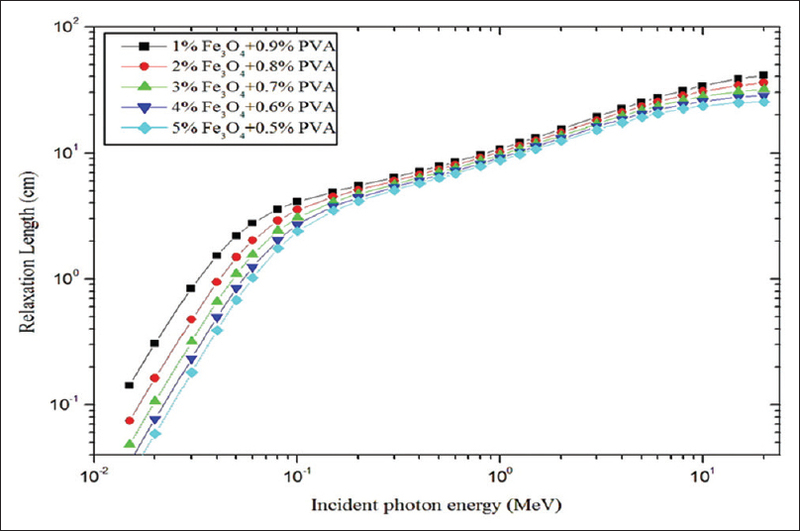 [Figure 7] represents the calculated values of relaxation length of polymer composite with five different concentrations of Fe3O4 for the incident photon energy range of 0.015–20 MeV. It linearly increased with respect to photon energy up to 0.2 MeV and also significant difference was found between the concentrations. 0.5% of magnetite has minimum values of relaxation length compared to other concentrations. KERMA relative to air values are calculated over the photon energy range of 15 keV to 20 MeV [Figure 8]. 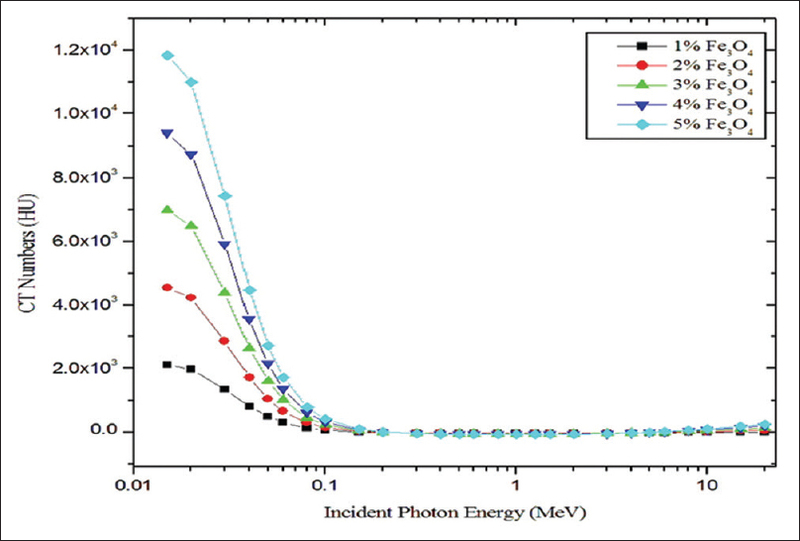 For incident photon energies above 0.2 MeV the values were almost unity for all concentrations of magnetite, and for incident photon energies <0.2 MeV significant variation was observed. Maximum values of KERMA relative to air were found for 30 keV for 0.5% of the magnetite which was 17.55. Effective atomic numbers (Zeff) and electron density (ϼe) of the PVA/iron oxide composite increased with increasing concentration of the magnetite; it may be due to the variation in the elemental weight fraction [Table 1]. Magnetite mainly contains iron (Fe) element with an atomic number of Z = 26; with increasing concentration of magnetite, the percentage of iron also increases in the sample., This may be the reason behind the higher Zeff, ϼe and lower ne of the polymer composite with respect to increasing concentration. Our calculated Zeff was in good agreement with Singh et al. within 1.56% for PVA. Another study by Manjunatha et al. also suggests that due to the presence of elements such as Ti, Co, Zn, As, and Cd in cancer tissues, they have higher Zeff, ne. Bone equivalence was observed at 0.2% of magnetite when compared to Jayachandran studies according to Zeff values. Photons are attenuated in the material via three major ways such as photoelectric absorption, compton scatters, and pair production process. Radiological properties such as mass attenuation coefficient (μ/ϼ), linear attenuation coefficient (μ), CT number (HU), KERMA relative to air, HVL, and TVL show variations between different concentrations in the lower energy range (<100 keV); it may be due to the increased photoelectric absorption. Photoelectric absorption simply expressed in (Z/E)3, where E is the energy and Z is the atomic number of the materials., At higher concentration of magnetite, the Zeff values were higher, it was around 18.060. It enables to enhance the photoelectric absorption in lower energies and considerable element composition dependence was observed. Biswas et al. developed and studied the shielding properties of polyboron material. They conclude that this material is used as a biological radiation shielding between the energy ranges of 0.125 MeV to 6 MeV. In this regard, our calculated values of mass attenuation coefficient (PVA/iron oxide composite) was compared with their values and it was found to be superior to that of polyboron, polyethylene, and ordinary concrete [Figure 1]. Another study by Mann et al. studied the shielding effectiveness of polymers, plastics, and their result found that polyvinyl chloride is the best shielding material with gamma energy range of 10–110 keV. The purpose of presenting the HVL [Figure 4] and TVL [Figure 5] graphs are, choosing the appropriate thickness of the PVA/iron oxide polymer composite for shielding against particular energies of radiation (10 keV-20 MeV). Relaxation length (ƛ) is useful for the easy comparison of the shielding effectiveness of different concentrations of Fe3O4. Radiation shielding effectiveness of PVA/iron oxide polymer composite was varied in the following order of magnetite concentration: 0.5% >0.4 > 0.3 > 0.2 > 0.1. For example, 0.5% of magnetite has the lower relaxation length compared to 0.1% concentration. Polymer composite possessed minimum values of relaxation length at the highest concentration of magnetite [Figure 7]. Hence, we concluded that material which possessed minimum values of relaxations length offers the best shielding against gamma rays. In intermidiate energy range, compton scattering is the more predominant interaction process and it is dependent on the electron density. Electron density for the polymer composite with 0.5% of Fe3O4 was 2.589x10^24 (e.cm^-3).,, Hence, in this energy range due to compton scattering, the variation between the concentrations was not observed like photoelectric absorption region of energy; it may be due to the small variation in the electron density [Table 1]. At higher energies, > 1.02 MeV small changes were obsorbed between the concentration relative to intermidiate energies. It may be due to the pair production process and it depends on the Z^2 of the atomic number., KERMA relative to air value of PVA/iron oxide composite (0.3%, 0.4%, and 0.5% of Fe3O4) was superior to that previous Mann et al. 's study of polyvinyl chloride [Figure 8]. This simply indicates that PVA/iron oxide composite with Fe3O4 concentration levels higher than 0.3% has better photon attenuation properties compared to polyvinyl chloride. A sharp peak located at 30 keV is the indication of higher kinetic energy released per unit mass of the composite. 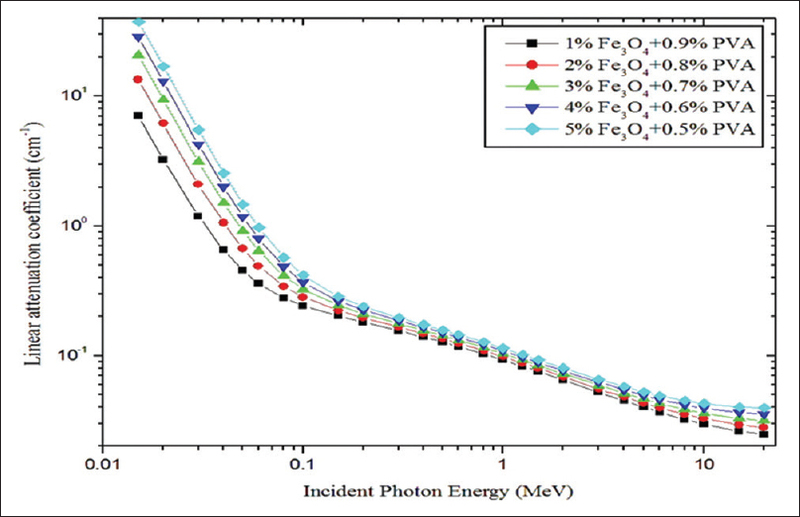 The presence of the higher percentage of iron makes the composite (0.5% Fe3O4) to have superior photon removal capabilities compared to other lower concentration of magnetite. CT number has the direct relationship with linear attenuation coefficient (μ) and μ gives the combined effect of density and materials composition (Zeff). Polymer-doped Fe3O4 is one of the contrast agents in magnetic resonance imaging., For exploring this into computed tomography application, we studied the CT numbers of the polymer composite [Figure 3]. CT number of the conventional contrast agent iodine and soft tissue and0.5% of the composite were compared. Results found that CT numbers were in the following order: iodine >0.5% of Fe3O4 polymer composite >soft tissue. Radiation shielding properties of PVA/iron oxide polymer composite were verified with different concentrations of magnetite. Magnetite with 0.5% of concentration gives superior shielding properties according to its relative shielding parameters. At lower energy range of <100 keV, element composition dependence was more compared with other intermediate and higher energy level and it may be due to atomic number dependence of photoelectric absorption. Further studies are needed to know the flexibility of polymer composite with different concentration of magnetite. Nambiar S, Yeow JT. Polymer-composite materials for radiation protection. ACS Appl Mater Interfaces 2012;4:5717-26. Singh VP, Badiger NM, Kaewkhao J. Radiation shielding competence of silicate and borate heavy metal oxide glasses: Comparative study. J Non Cryst Solids 2014;404:167-73. Mann KS, Sidhu GS. Verification of some low-Z silicates as gamma-ray shielding materials. Ann Nucl Energy 2012;40:241-52. Mann KS, Rani A, Heer MA. Shielding behaviors of some polymer and plastic materials for gamma-rays. Radiat Phys Chem 2015;106:247-54. Oto B, Yıldız N, Akdemir F, Kavaz E. Investigation of gamma radiation shielding properties of various ores. Prog Nucl Energ 2015;85:391-403. Bashter II, El-Sayed Abdo A, Samir Abdel-Azim M. Magnetite ores with steel or basalt for concrete radiation shielding. Jpn J Appl Phys 1997;36:b92-6. Creutz E, Downes K. Magnetite concrete for radiation shielding. J Appl Phys 1949;20:1236. Harrison C, Weaver S, Bertelsen C, Burgett E, Hertel N, Grulke E. Polyethylene/Boron nitride composites for space radiation shielding. J Appl Polym Sci 2008;109:2529-38. Nicolais L, Carotenuto G. Metal-Polymer Nanocomposites. 1st ed. Vol. 1. Hoboken, New Jersey: John Wiley & Sons, Inc.; 2005. Harish V, Nagaiah N, Niranjana Prabhu T, Varughese KT. Preparation and characterization of lead monoxide filled unsaturated polyester based polymer composites for gamma radiation shielding applications. J Appl Polym Sci 2009;112:1503-8. Nambiar H, Yeow JT. Lead oxides filled isophthalic resin polymer composites for gamma radiation shielding applications. Indian J Pure Ap Phy 2012;50:847-50. Nambiar S, Osei EK, Yeow JT. Polymer nanocomposite-based shielding against diagnostic X-rays. J Appl Polym Sci 2013;127:4939-46. Badawy SM, Abd El-Latif AA. Synthesis and characterizations of magnetite nanocomposite films for radiation shielding. Polym Compos 2017;38: 974-80. Kucuk N, Cakir M, Isitman NA. Mass attenuation coefficients, effective atomic numbers and effective electron densities for some polymers. Radiat Prot Dosimetry 2013;153:127-34. Singh VP, Medhat ME, Badiger NM, Rahman AZ. Radiation shielding effectiveness of newly developed superconductors. Radiat Phys Chem 2015;106:175-83. Singh VP, Badigerv NM. Study of effective atomic numbers and electron densities, kerma of alcohols, phantom and human organs, and tissues substitutes. Nucl Technol Radiat Prot 2013;28:137-45. Biswas R, Sahadath H, Mollah AS, Huq F. Calculation of gamma-ray attenuation parameters for locally developed shielding material: Polyboron J Radiat Res Appl Sci 2016;9:26-34. Mann KS, Kaur B, Sidhu GS, Kumar A. Investigations of some building materials for g-rays shielding effectiveness. Radiat Phys Chem 2013;87:16-25. Singh VP, Badiger NM. Gamma ray and neutron shielding properties of some alloy materials. Ann Nucl Energy 2014;64:301-10. Hubbell JH, Seltzer SM. Tables of X-ray Mass Attenuation Coefficients and Mass Energy-Absorption Coefficients 1 keV to 20 MeV for Elements Z¼ 1 to 92 and 48 Additional Substances of Dosimetric Interest. NISTIR-5632. Gaithersburg: National Institute of Standards and Technology; 1995. Manjunatha HC. Comparison of effective atomic numbers of the cancerous and normal kidney tissue. Radiat Prot Environ 2015;38:83-9. Ranjbar H, Shamsaei M, Ghasemi MR. Investigation of the dose enhancement factor of high intensity low mono-energetic X-ray radiation with labeled tissues by gold nanoparticles. Nukleonika 2010;55:307-12. Faiz Khan M. The Physics of Radiation Therapy. 4th ed. Maryland, USA: Williams and Wilkins Publishers; 1994. Manohara SR, Hanagodimath SM, Gerward L. Studies on effective atomic number, electron density and kerma for some fatty acids and carbohydrates. Phys Med Biol 2008;53:N377-86. Mann KS, Korkut T. Gamma-ray buildup factors study for deep penetration in some silicates. Ann Nucl Energy 2013;51:81-93. Sukhoruchkin SI, Soroko ZN. Atomic Mass and Nuclear Binding Energy for Fe-56 (Iron). of the Series Landolt-Börnstein – Group I Elementary Particles, Nuclei and Atoms. Vol. 22A. Springer: Geneva; 2009. p. 2276-8. Herrmann G. Synthesis of the Heaviest Chemical Elements-Results and Perspectives. Angewandte Chemie 1998:27;1417-36. Gagandeep SK. Effective atomic number studies in different body tissues and amino acids. Indian J Pure Appl Phys 2002;40:442-9. Jayachandran CA. Calculated effective atomic number and kerma values for tissue-equivalent and dosimetry materials. Phys Med Biol 1971;16:617-23. Singh T, Kaur P, Singh PS. A study of photon interaction parameters in some commonly used solvents. J Radiol Prot 2007;27:79-85. Kwatra D, Venugopal A, Anant S. Nanoparticles in radiation therapy: A summary of various approaches to enhance Radiosensitization in cancer. Transl Cancer Res 2013;2:330-42. Aus RJ, DeWerd LA, Pearson DW, Micka JA, Ng KH. Dependence of scatter on atomic number forxrays from tungsten and molybdenum anodes in the mammographic energy range. Med Phys 1999;26:1306-11. Curry TS, Dowdey JE, Murry RC. Medical. In: Christensen's Physics of Diagnostic Radiology. Lippincott Williams & Wilkins;1990. p. 522. Singh VP, Badiger NM. Investigation on radiation shielding parameters of ordinary, heavy and super heavy concretes. Nucl Technol Radiat Prot 2014;29:149-56. Hoy CF, Naquib HE, Paul N. Fabrication and control of CT number through polymeric composites based on coronary plaque CT phantom applications. J Med Imaging (Bellingham) 2016;3:016001. Arsalani N, Fattahi H, Nazarpoor M. Synthesis and characterization of PVP-functionalized superparamagnetic Fe3O4nanoparticles as an MRI contrast agent. Express Polym Lett 2010;4:329-38. Ohno K, Mori C, Akashi T, Yoshida S, Tago Y, Tsujii Y, et al. Fabrication of contrast agents for magnetic resonance imaging from polymer-brush-afforded iron oxide magnetic nanoparticles prepared by surface-initiated living radical polymerization. Biomacromolecules 2013;14:3453-62.